Bringing the online kitty craze offline and out into the open… Open Field, that is. It’s no secret that internet cat videos have been all the rage for some time now. Traditionally, we send these viral gems to one another via email or share them through various social media outlets. Some viewers (yours truly included) spend precious free time obsessively occasionally trolling the interwebs for hilarious 30-second clips of feline tomfoolery. Either way, while enjoyed by a broad online audience of millions, cat videos are normally viewed alone. As Walker Open Field’s Cat-lady-in-Residence (just kidding, that’s not a real position…yet), I could not be more excited to literally bring this solo cat video viewing behavior out in the open. Walker Open Field welcomes cat lovers (and challenges haters – c’mon, you know who you are) to openly release your cat-video-induced giggles and emotions that are otherwise muffled by computer screens and constrained by cubicles. Rejoice and be free like my favorite triumphant slow-motion kitten playing in the video below. Let’s transform this singular small screen viewing experience into a shared celebration with the larger-than-life projection of these silly clips out on the Open Field. 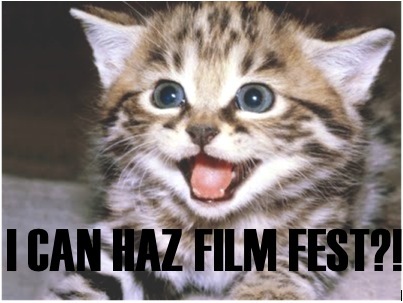 Mark your calendars now for Thursday evening, August 30, 2012 for this Internet Cat Video Film Festival. Come together on Open Field and LOL in the presence of others. Experience the shared joy of a surprised kitten or keyboard cat and discover new favorites in this carefully curated series of cat videos. The film fest will commence at dusk, after Harvest Party‘s Acoustic Campfire performance by Brian Laidlaw and the Family Trade. This activity is free, open to the public, and cat-friendly. And no, you do not have to be a so-called cat-lady to attend. Cool chicks, dudes and dog-lovers are, of course, also welcome… because you know you love that one video of the cat jumping in and out of a box.